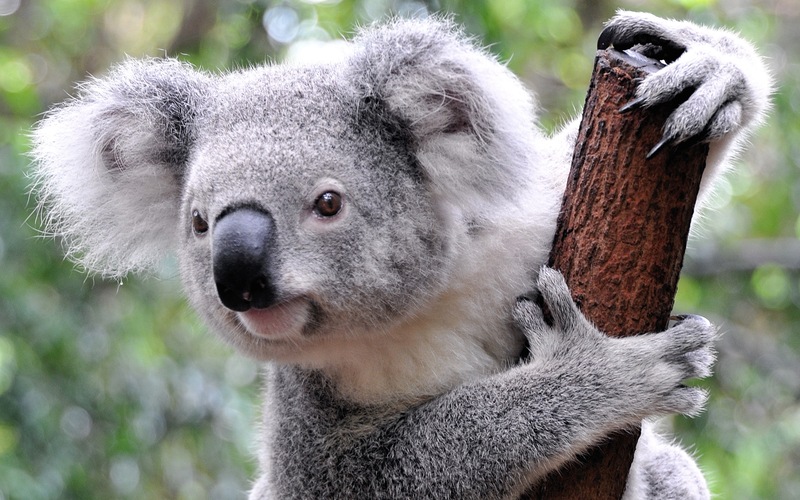 Koala is a small marsupial (pouched mammal) that lives in Australia. Koalas are arboreal, they spend most of their time in eucalyptus (gum) trees. These nocturnal (most active at night) animals spend 18 to 20 hours each day resting and sleeping; they spend much of the night eating. They are aggressive animals who live in woodlands. Koalas are not bears; their closest relative is the wombat. The genus and species of the koala is Phascolarctos cinereus. These herbivores (plant-eaters) eat mostly eucalyptus (gum tree), chewing these tough leaves using their powerful jaws. They store unchewed food in cheek pouches. Koalas have a keen sense of smell which they use to make sure the type of gum leaves are edible and not poisonous.